Xalid Eli, an official from the Syrian-based political organization Kurdish National Council, said Sunday that PKK's tyranny has surpassed that of Syrian leader Bashar Assad and he added that Kurdish politicians have been terrorized by the militant group. "Our friends put in jail by the PKK were people that had worked in politics for a long time. They are the people working for the freedom of the Kurdish people," Eli said. "Assad sent the PKK to fight us in order to destroy Kurdish political parties. The regime has put pressure on Kurds in Rojava by cooperating with the PKK and the pressure still persists," he added. Saying that the PKK is a "baton in the regime's hands," Xalid Eli added, "The PKK is not on the side of the Kurds. Even Bashar Assad or his father did not harm us as much as the PKK. The Assad regime could not have changed the demographics of Rojava as much as the PKK did." Turkey, the U.S., EU and many other countries officially recognize the PKK as a terrorist organization. PYD militants last week set fire to a Kurdistan KNC office in the town of Amuda in Hasakah province, northern Syria, Anadolu Agency (AA) reported on March 11. According to Syria Kurdistan Democratic Party (SKDP) Council Member Nuri Brimo, armed PYD militants raided the SKDP office in Amuda in the early morning hours before setting it on fire. "After the PKK's attack on peshmerga forces in Sinjar [northern Iraq], the oppression of the KNC has intensified in Rojava," Brimo said. 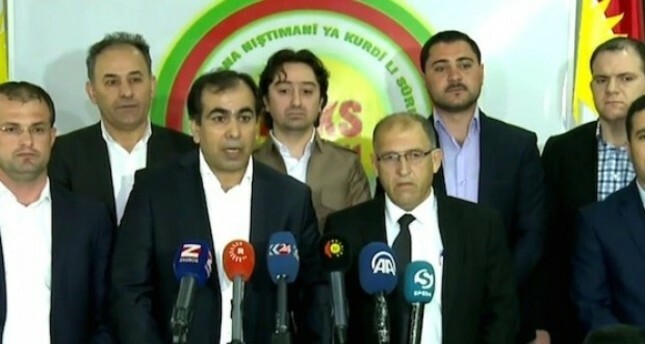 KNC representative in the Kurdistan Regional Government (KRG) in northern Iraq, Khalid Ali, said last week that the PYD had also kidnapped 62 KNC members and was holding them in an unknown location. Meanwhile, Eziz Weysi, commander of the Zerewani peshmergas, told AA in a recent interview that the YPG is a tool used to bash political powers that do not comply with the PYD. "The current authority in Rojava [the YPG], unfortunately works as a baton for a political authority to bring other political powers into line," he said. Slamming the PYD's notion that the region belongs to them because of the blood they have put into it, Weysi said the peshmerga would be where the YPG is now if they had been allowed. Weysi criticized the PYD for challenging the peshmerga. "We remained patient and waited for them to come to their senses and open a way," he said. The commander general asserted that the PYD has only two options: they either have to side with the peshmerga or look on while the peshmerga enters Rojava. KNC officials have said numerous times that Syrian Kurds are opposed to both the Assad regime and the PYD, as much of Syria's Kurdish population has been forced to flee the country in recent years due to ongoing human rights' violations committed by the PYD. Several human rights monitoring groups, including Human Rights Watch and Amnesty International, revealed information about the PYD's forcible recruitment of underage children and its deployment of child soldiers, exposing the PYD's unlawful and exploitative use of children as well as adults forcibly conscripted to serve in their ranks. Currently controlled largely by the PYD, Rojava is comprised of the Syrian provinces of Al-Hasakah, Al-Raqqa and Aleppo. The YPG, which is the Syrian affiliate of the PKK terrorist group, has also taken a hostile approach toward Turkey since its inception. The terrorist group has attacked Turkish troops in Syria and YPG-trained militants have carried out attacks in Turkey in the past. The former Obama administration's strong backing of the YPG soured Turkish-U.S. relations and the U.S. continues to express support for the terrorist group. The U.S. considers the PYD and its armed wing, the YPG, to be effective forces in the fight against Daesh in Syria while Turkey, a NATO ally, argues that Washington has joined forces with a terrorist group. Ankara argues that the army's support to the SDF/PYD ultimately benefits the PKK terror group, which has been in conflict with Turkey for more than three decades and has caused the loss of more than 40,000 lives.